Over a year ago, in late summer 2007, I was contacted by Alan Digby, editor of The Beano, to enquire if I'd be interested in drawing a brand new strip for the weekly. Naturally I jumped at the chance, as long as I could fit it in with my other workload. I'd drawn a strip for the Beano only once before, - a fill-in on a Fred's Bed strip that eventually appeared in last year's Christmas issue. (Another fill-in, this time on Ivy the Terrible, would appear a few months later.) 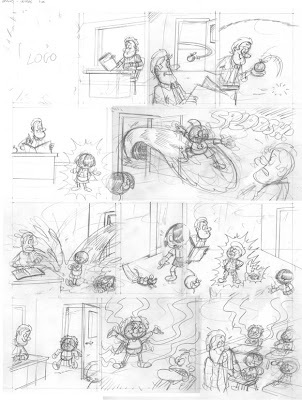 Several years ago I'd also contibuted several strips to the Fun-Size (digest) editions of Beano and Dandy, - and drew a few pages for a Beano Summer Special about 10 years ago, but that was my sum total of contributions for DC Thomson, which had always proven a tough nut to crack. Alan explained that he'd been looking through my back catalogue (presumably my website and not a huge secret database DC Thomson keep on people) and he thought I'd be ideal to draw a superhero comedy strip they were preparing. The working title for the strip was The Ultras and basically it would feature a classroom of young kids learning to use their super-powers. Alan's script arrived which set up the premise and he asked for character designs for the principal characters (above). At this early stage, the character who would become Waterboy was called Moon Boy (hence the crescent moon on his outfit in the early episodes) and the shape-changer was called Nature Boy (now Safari Sam). Invisible Isobel was specified to be an ethnic character, which was a positive step in my opinion. Her design was the one I liked most. I based her hairstyle on that of Kym Marsh from Coronation Street, assuming it'd be a style the kids would consider "cool". Stinkbomb was the class smelly kid, but he'd be using his powers for good. I gave him a skunk-like white stripe in his mop of hair. I suspect Stinkbomb may prove to be the most popular of the bunch. A second script soon followed from Alan and I drew that up too. The modern method of DC Thomson comics is for new strips to be tested by a focus group. As I understand it, a dummy issue is presented to a selected class or group of children and they're asked their opinions on the new material. The findings on The Ultras were mainly positive, although a title change was suggested. This initial process took quite a while, and Ultras didn't receive the final go-ahead until several months after I drew those first two episodes. 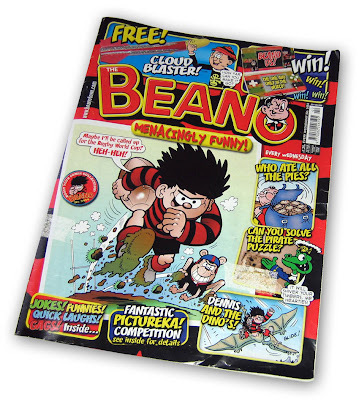 Once the editor had the green light the strip was scheduled for the next "revamp" issue of The Beano, which wouldn't be until October 2008. Plenty of time to turn around the scripts that Alan was now sending to me on a regular basis. 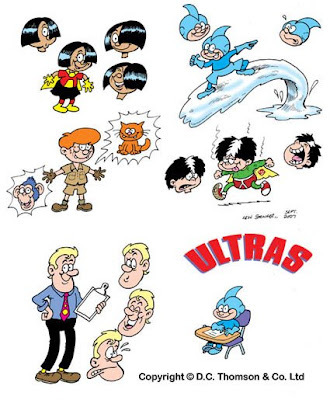 The strip was still called Ultras in the scripts until a few months ago, and even mentioned as such in The History of The Beano as a forthcoming new series. Then the decision was made to change it to the more explanatory Super School (sub-tiled "Teaching Tomorrow's Heroes") and, with the new logo in place, the first episode was scheduled for The Beano No. 3454, dated October 18th 2008. I'm currently inking the strip for the Christmas issue. Sneak preview below! As you can see I've designed the logo for this one, complete with traditional snow on the lettering. New strips that have longevity aren't that common in The Beano but hopefully Super School will prove popular with the readers. At present it's leading in the online Beano poll this week, but that could change at the click of a button. Whatever the outcome I'm having fun drawing it and I hope some of that enjoyment transfers over to the readers. As they said in the Sixties: Never Be Without A Beano! I have never read The Beano but i love your artwork. It never fails to bring a smile to my face. Bought "Brickman Begins" recently (really funny stuff) and i am currently on the lookout for the norwegian albumrelease of "Suburban Satanists". I can see from the Christmas pencil.that animalad (I know its not his real name..But it reminds me of Mitchs Whoopee work) changes into a beever to gnaw down the Christmas tree..
Rereading it again what was moonboys powers to be......or was it still the use of water...the moon controls the tides.. I see also you drew this strip in full and not two halves...do you normally draw in whole..the larger it is I always end up smudging it when leaning over...so what size do you draw..what scale up..? The page was drawn in two halves as I usually do my pages. I just assembled it as one in Photoshop before sending it to the editor. 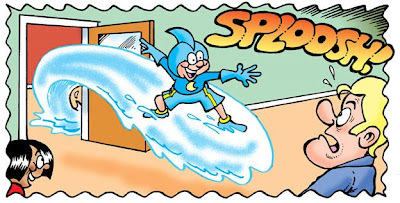 Yes, Moon Boy had exactly the same powers, controlling water. He was also going to be called Jet Boy at one stage before they settled on Water Boy. Congrats. I'll ask my family members in Bedford to send me a Beano. (this will revive a Christmas tradition.) Look forward to reading the strip.